Move the cursor over the list of dates in the column on the left to see the extent of the builtup area of Tonbridge at each date. In 1750 Tonbridge was a small market town – little more than a village – sited almost entirely north of the river. But the Medway had been made navigable, and with greater commercial activity in the town the population increased threefold by 1838 (though this is not very evident on the maps*). The arrival of the railway in 1842 led to the growth of a 'New Town' south of the tracks, already clearly visible on the 1871 map. The next three decades saw further building in this area and also in the Dry Hill area at the north end of the town, and in The Slade to the west of the High Street. Continuing growth in all areas is evident on the 1908 map, particularly in the south between the river and railway along Barden Road and south of the railway, and up Quarry Hill. By 1936 there has been yet more expansion in the south, and creeping development is appearing along the roads to Hildenborough, Shipbourne and Hadlow. 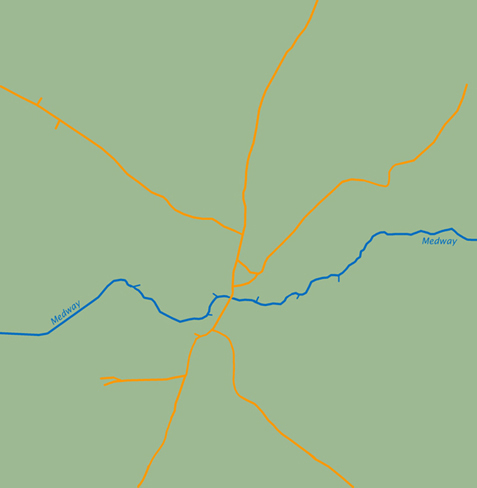 In the remainder of the 20th century the town's population doubles as a result of massive development at the north end from the 1950s, and further expansion in all other areas, leading to the dumbbell shape visible on the 2005 map. Better flood control has made possible the creation of a commercial area between river and railway on the east side of the High Street, and new roads have been built here. Overall, the population of Tonbridge has grown more than thirty-fold in two hundred and fifty-years. Twice as many people now live in the town as were here in 1945, an increase fuelled in part by increasing numbers of commuters, with 6,500 season-ticket holders now using Tonbridge and Hildenborough stations. Recent development has taken the form of 'infilling' mainly with blocks of flats built on former industrial sites, particularly alongside the river. These increase the population density, but not the extent of the built-up area on the map. *The 1750 map is from Neve's 'Tonbridge of Yesterday' (1933) and is partly conjectural.